On this day in history a major battle was fought in the American War of Independence. The battle of Hubbardton was fought. It involved American Revolutionary forces and the British army. The patriots are mostly from units of the Continental Army with some militia units. The British are composed of regular British army soldiers and mercenaries. The battle is notable as it was the only battle fought in the state of Vermont, in the entire war. The British were under the command of German General Friedrich Adolph Riedesel and Freiherr zu Eisenbach. The later commander was in command of the German mercenaries and they are largely drawn form the Hessian region of Germany and they are known as Hessians and they are formidable fighters. The battle took place during the Saratoga campaign. It began when the British surprised some American units in retreat from Fort Ticonderoga. Men from Colonel Seth Warner’s Green Mountain Boys, Colonel E. Francis’ 11th Massachusetts Regiment and Colonel Nathan Hale’s 2nd New Hampshire Regiment had been asked to provide cover for the rest of the American army. These units are attacked by the British in a surprise attack. The patriots were able to hold their positions despite superior numbers for some time. Then a group of German mercenaries charged the patriot lines as they charged they sang hymns. The Patriots are forced back to a nearby hill. The highly disciplined German mercenaries won the field and during the fighting, the Patriots commander was killed. However, although technically a defeat the battle was a strategic victory for the American rebels. The Patriots who had fought at this battle had been able to protect the rear guard of the retreating army. If this army had been attacked when in full retreat they would have been possibly heavily defeated and suffered massive loss of life. The Patriots who had taken place in the battle are later able to join the rest of the army. They had suffered heavy loss and had lost over 40 dead and 100 wounded. Some 200 are captured. The Patriots managed to hold their position at nearby Monument Hill for over an hour until Baron Riedesel led his hymn-singing Brunswick Grenadiers into the fray. The disciplined German force gained the field, and Colonel Francis lost his life to wounds inflicted during the conflict. The battle was part of the Saratoga campaign. Some three months later at the Battle of Bernis Heights, the Americans inflicted a heavy defeat on the British. 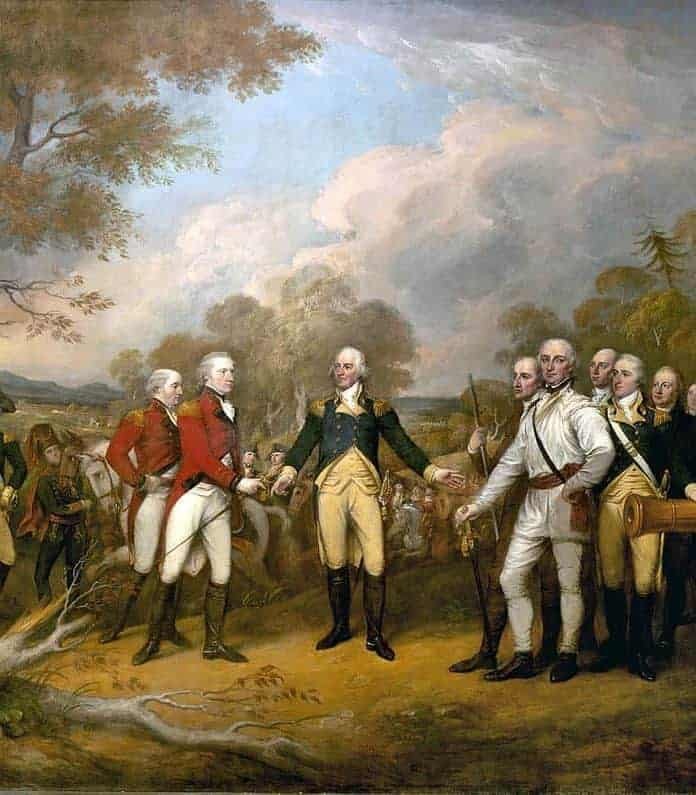 This proved very important and it ultimately led to the surrender of the British general John Burgoyne’s surrendered. The leader of the German mercenaries tried to escape but was later captured by the Patriots.